There is a terrific operation of the Spirit going on today to bring the Sons of God into an absolute confinement to the perfect will of God. This is the Day of His Preparation the day in which He is preparing the channel through which He shall pour forth His Glory for all the world to see. This channel is His Body in the earth that glorious company of people who are being conformed through much tribulation and fiery tests to the Image of the Son of God. This is His "battle axe and weapons of war" with which He shall subdue kingdoms and overcome all His enemies. This is His "mighty and strong One" to whom He shall commit the work of judging this world. This is His Overcomer, His "great army" with which He shall bring the nations into submission. The weapons of their warfare are not carnal, natural weapons but they are mighty weapons, mighty through God to the pulling down of strongholds. These are those who shall "be strong and do exploits." But before God can commit this great and tremendous ministry into their hands they must submit themselves to the discipline of the Lord letting Him truly be the Lord of their entire lives. We have long since dealt with the question of open sin but now God is dealing with the inward rebellion of our own wills. Some good Christians are not now being so dealt with for they are not in this Firstfruits Company but nevertheless there is a real dealing of God going on within those who are called into the High Calling of God. This is a very real thing and is the work of the Refiner's Fire. To those who are going through it some of its aspects are horrible but very necessary and the end result thereof is glorious as we are brought into absolute and complete submission to the will of our Lord. On a dirt road in the middle of a wide field stood a beautiful carriage, something on the order of a stagecoach but all edged in gold and with beautiful carvings. 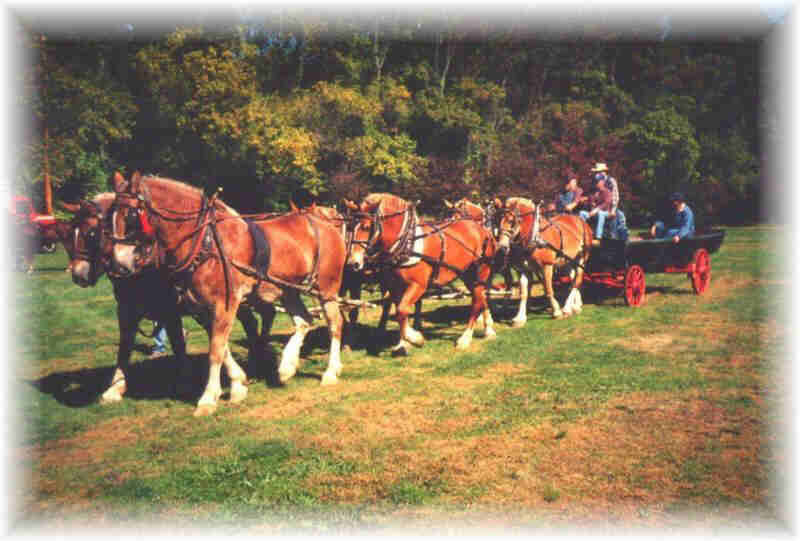 It was pulled by six large chestnut horses: two in the lead, two in the middle and two in the rear. But they were not moving, they were not pulling the carriage, and I wondered why. Then I saw the driver underneath the carriage on the ground on his back just behind the last two horses' heels working on something between the front wheels on the carriage. I thought, "My, he is in a dangerous place; for if one of those horses kicked or stepped back, they could kill him, or if they decided to go forward, or got frightened somehow, they would pull the carriage right over him." But he didn't seem afraid for he knew that those horses were disciplined and would not move till he told them to move. The horses were not stamping their feet nor acting restless, and though there were bells on their feet, the bells were not tinkling. There were pom-poms on their harness over their heads but the pom-poms were not moving. They were simply standing still and quiet waiting for the voice of the Master. As I watched the harnessed horses I noticed two young colts coming out of the open field and they approached the carriage and seemed to say to the horses: "Come and play with us, we have many fine games, we will race with you, come catch us." And with that the colts kicked up their heels flicked their tails and raced across the open field. But when they looked back and saw the horses were not following they were puzzled. They knew nothing of the harnesses and could not understand why the horses did not want to play. So they called to them: "Why do you not race with us? Are you tired? Are you too weak? Do you not have strength to run? You are much too solemn, you need more joy in life." But the horses answered not a word nor did they stamp their feet or toss their heads. But they stood, quiet and still, waiting for the voice of the Master. Again the colts called to them: "Why do you stand so in the hot sun? Come over here in the shade of this nice tree. See how green the grass is? You must be hungry, come and feed with us, it is so green and so good. You look thirsty, come drink of one of our many streams of cool clear water." But the horses answered them not so much as a glance but stood still waiting for the command to go forward with the King. The scene changed and I saw the other colt standing on the side of a hill nibbling at some grass. Then across the fields, down the road came the King's carriage drawn by six horses. With amazement he saw that in the lead, on the right side, was his brother colt now made strong and mature on the good corn in the Master's stable. He saw the lovely pom-poms shaking in the wind, noticed the glittering gold bordered harness about his brother, heard the beautiful tinkling of the bells on his feet -- and envy came into his heart. Thus he complained to himself: "Why has my brother been so honored, and I am neglected? They have not put bells on MY feet nor pom-poms on MY head. The Master has not given ME the wonderful responsibility of pulling His carriage, has not put about ME the gold harness. Why have they chosen my brother instead of me?" And by the Spirit the answer came back to me as I watched: "Because one submitted to the will and discipline of the Master and one rebelled, thus has one been chosen and the other set aside." "Write the vision, and make it plain upon tables, that he may run that readeth it," (Habakkuk 2:2). "Harness the horses; and get up, ye horseman," (Jeremiah 46:4). I am sure that many of you who can hear what the Spirit saith to the Church have already seen what God was showing in the vision. But let me make it plain. Being born into the Family of God feeding in the green pastures and drinking of the many streams of the unfolding revelation of His purposes is fine and wonderful. But it is not enough. While we were children, young and undisciplined, limited only by the outer fence of the Law that ran around the limits of the pastures (that kept us from getting into the dark pastures of poison weeds) He was content to watch us develop and grow into young manhood, spiritually speaking. But the time came to those who fed in His pastures and drank at His streams, when they were to be brought into discipline or "child-training" for the purpose of making them mature Sons. Many of the children today cannot understand why some of those who have put on the harness of God cannot get excited by the many religious games and the playful antics of the immature. They wonder why the disciplined ones run not after every new revelation or feed on every opportunity to engage in seemingly "good and profitable" religious activities. They wonder why some will not race with them in their frantic efforts to build great works and great and notable ministries. They cannot understand the simple fact that this Company of saints is waiting for the voice of the Master and they do not hear God in all this outward activity. They will move in their time when the Master speaks. But not before, though many temptations come from the playful colts. And the colts cannot understand why those who seemingly appear to have great abilities and strength are not putting it to good use. "Get the carriage on the road," they say, but the disciplined ones, those in God's harness, know better than to move before they hear the voice of the Master. They will move in their time with purpose and great responsibility. And the Lord made me to know that there were many whom He had brought into training who had rebelled against the discipline, the chastising of the Father. They could not be trusted with the great responsibility of mature Sonship so He let them go back to their freedom, back to their religious activities and revelations and gifts. They are still His people, still feeding in His pastures, but He has set them aside from the great purposes for this end of the age. So they revel in their freedom feeling that they were the Chosen Ones with the many streams of living water not knowing that they have been set aside as unfit for His great work in this end of the age. He showed me that though the chastising seemeth grievous for the time and the discipline hard to endure yet the result with all the glory of Sonship is worth it all and the glory to follow far exceeds the suffering we endure. And though some lose even their lives in this training yet they will share alike in the glory of His eternal purposes. So faint not saints of God for it is the Lord that doth bring thee into confinement and not thine enemy. It is for thy good and for His glory so endure all things with praises and thanksgiving that He hath counted thee worthy to share His glory! Fear thou not the whip in His hand for it is not to punish thee but to correct and train thee that thou mightest come into submission to His will and be found in His likeness in that hour. Rejoice thou in thy trials in all thy tribulations and glory thou in His cross and in the confining limitations of His harness for He hath chosen thee and He hath taken upon Himself the responsibility of keeping thee strong and well fed. So lean thou upon Him and trust not in thine own ability and thine own understanding. So shalt thou be fed and His hand shall be upon thee and His glory shall overshadow thee and shall flow through thee as it goes forth to cover the earth. Glory to God! Bless the Lord! He's wonderful! Let Him be Lord of your life, friends, and complain not at that which He bringeth to pass in your life. For in the hour when famine sweeps the land He shall feed by His own hand those who are submitted to His perfect will and who dwell in the secret place of the Most High. When terror stalks the land those in His harness shall not be afraid for they shall feel His bit and bridle and know the guidance of His Spirit. When others are weak and frail and fearful there shall be those who shall be strong in the power of His might and shall lack for no good thing. In the hour when the traditions of the religious systems have proven false and their streams have dried up, then His Chosen Ones shall speak forth with the true Word of the Lord. So rejoice, Sons of God, that you have been chosen by His grace for this great work in this last hour. The fence which kept the colts in their own meadows and their own pastures mean nothing to the team in the harness for the gates open to them and they go forth pulling the King's carriage into many strange and wonderful places. They do not stop to eat the poison weeds of sin for they feed only in the Master's stable. These fields they trample under their feet as they go forth on the King's business. And so to those who are brought into absolute subjection to His will there is no Law. For they move in the Grace of God led only by His Spirit where all things are lawful but not all things are expedient. This is a dangerous realm for the undisciplined and many have perished in sin as they leaped over the fence without His harness and His bridle. Some have thought of themselves as being completely harnessed and submissive to Him only to find that in some avenue of their life there dwelled rebellion and self-will. Let us wait before Him until He puts His noose around us and draws us to His place of training. And let us learn of the dealings of God and the movings of His Spirit until at last we feel His harness drop about us and hear His voice guiding us. Then there is safety from the traps and pitfalls of sin and then shall we abide in His House forever! Bill Britton served as Vice President of Pinecrest Bible Training Center for the first three years of its existence and was a great blessing in helping to establish the work at Pinecrest. For more of these and other messages: Bill Britton P.0. Box 707 Springfield, Missouri 65801-0707 This is a faith ministry, made possible by members of the Body of Christ. Not copyrighted, may be translated or reprinted without further permission. All message free as the Lord provides. To fully enjoy this site, please upgrade your Flash Player. Download takes 30 seconds on a dialup connection.